She timed escape routes on two continents, planned large-scale arson, cased buildings for break-in points and scouted locations for the perfect place to commit murder — and she describes it all with unveiled glee. Tucsonan Jennifer Lee Carrell is no international criminal — she's an author. The seemingly illicit activities were research for her first novel, "Interred With Their Bones." The fast-paced, Shakespearean-themed mystery thriller hit stores nationwide 10 days ago and already has earned rave reviews. The novel will be published in 24 countries and has all the markings of an international success. Today you can read about how it happened. Sept. 20 is a day Jennifer Lee Carrell won't soon forget. It marked the release of her first novel, "Interred With Their Bones," and the realization of her lifelong ambition. For Carrell, a Rincon High School graduate who once longed to be both a writer and a ballet dancer, getting to this point took a leap of faith, a bit of luck and a lot of talent. Within the first 10 days, the mystery thriller — Carrell's second book — earned enthusiastic praise from respected sources such as The New York Times Sunday Book Review and Publishers Weekly. "Not many first novels get this kind of great reviews and attention," Dutton President and Publisher Brian Tart said. "It deserves a wide audience." It's a promising kickoff to a book that eventually will hit shelves in 23 other countries and 18 other languages and may propel Carrell into the role of an internationally acclaimed author. Tart has already agreed to publish her next novel. "She has a very, very bright career ahead of her," said Noah Lukeman, the New York literary agent who "discovered" Carrell in an unusual fashion. "I think that her star has only begun to rise." By age 5, books and ballet clearly topped Carrell's list of interests. Bill Carrell, the author's father and a retired Tucson Medical Center chief of staff, remembers occasionally catching his daughter at night reading under the covers with a flashlight. Her mother, Melinda Carrell, a longtime political and community volunteer, said the bigger problem was getting her daughter to put down a book and turn out the light in the first place. As an elementary school teacher in Maryland before she had children, Carrell's mother said she often saw youths take readily to books, but what made her daughter different was her desire to tell her own tales. "She loved books but she also loved making up her own stories from a very young age," the future author's mother said, adding that many of Carrell's early works involved princesses or ballerinas. "I've always loved fairy tales and epic stories of any kind," Jennifer Carrell said. "I like books that create thick worlds so it doesn't matter the genre. I like to be set in a place that has interesting human dramas going on." By the time Carrell graduated from high school in 1980, she appreciated Shakespeare both on the page and on the stage. She decided to study English literature at Stanford and pursue a ballet career, but the combination proved impractical. "It's fairly impossible to study (ballet) at that level and go to university," said the slender author whose 13 years of ballet training is still evident in her perfect posture. "I actually wanted to leave college to pursue dance, but my parents persuaded me to do otherwise, which was probably for the best." She submerged herself in school and earned degrees at Stanford, Oxford and Harvard universities, all the while writing fiction. After finishing her Ph.D., she stayed at Harvard as a Shakespeare lecturer and the director of the school's Shakespearean troupe. "I decided that a good way to support my fiction-writing habit would be to be a professor," the warmly accessible author joked with a lighthearted giggle. "I just threw myself into academics in general because I never thought I'd make a living as a writer," she said. "I feel very lucky that I've been able to make that my career." After four years of lecturing at Harvard, Carrell found that being a teacher and a writer was harder than she'd thought. In 1998 Carrell abandoned her academic career. "I found it impossible to have any energy left over after teaching and academic writing," she said. "My heart really lay with writing fiction and writing for a larger audience." She made the "big wrenching decision," according to her mother, to move back to Tucson to try her hand at a writing career. Carrell reviewed classical music and opera for the Arizona Daily Star and freelanced for other publications. One piece — a Smithsonian magazine article about Sir Isaac Newton's interest in alchemy — caught the eye of literary agent Lukeman in December of 2000. "It's rare for an agent to call someone based on an article," said Lukeman, who receives about 10,000 book queries annually and, on average, will accept only one. "It's very, very rare. You have to be able to recognize talent and potential. In her case I felt I recognized something." Lukeman presented Carrell with a golden opportunity — the chance to turn the article into a nonfiction book. Her delight at being discovered was short-lived. She found she couldn't write the book. "I literally kept falling asleep on my research books," she admitted. Rather than pass on a big break, Carrell proposed a different book in which each chapter chronicled a relatively unknown aspect of a historic event. One chapter concept — about the individuals who introduced smallpox inoculation to Western medicine 75 years before the discovery of the vaccination — captured Lukeman's attention, and he immediately requested that she write an entire book about it. The idea, which Carrell had tried and failed to freelance as an article for years, was suddenly timely due to the post-9/11 bioterrorism scare. "Smallpox was once again a threat (at least in the media), and I thought people would be interested to read a beautifully written story of two mavericks who fought the system for the betterment of society," said Tart, who was editor in chief when Dutton won the bidding war for Carrell's first book. "It had big ideas and a great message, and Jennifer's research was impeccable." Carrell left the Star to concentrate on the book full time. Reams of paper piled up as she pieced together the little-known story through documents found at the University of Arizona's Health Sciences Library as well as in Boston and London. "I researched and wrote it in 10 months, but it was nearly the end of me," she said. "I was also planning my wedding at the same time." 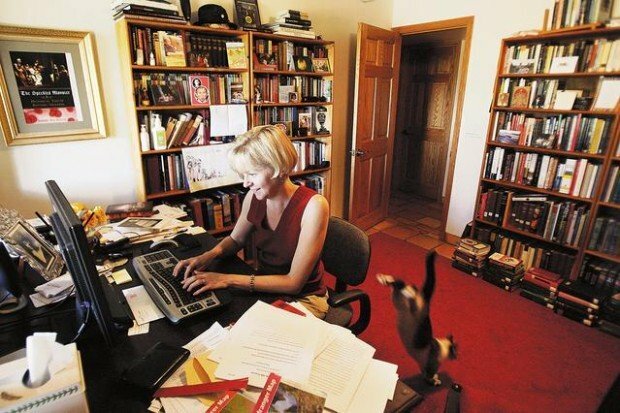 She married Tucson lawyer Johnny Helenbolt in October 2002, 25 days after submitting her manuscript for "The Speckled Monster: A Historical Tale of Battling Smallpox." The creative nonfiction tale has sold around 20,000 copies since it hit stores in 2003 — a respectable number for a history, Tart said. Lukeman immediately inquired whether Carrell could write another book in the same vein. While searching for a new subject, the author kept her creativity flowing by co-writing the screenplay "The Black Prince," a medieval war epic that Warner Bros. picked up, and an independent screen adaptation of "Macbeth" now in production. After six months of research, she failed to find a subject that both captured her imagination and had the necessary copious evidence required to string together a nonfiction tale. 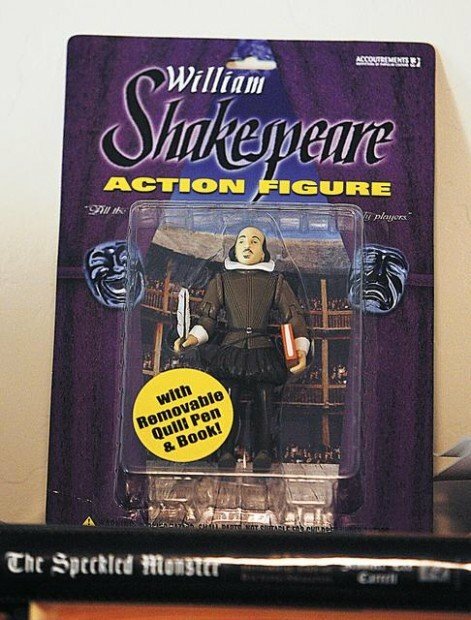 Again she went back to her agent with a counteroffer — this time with an idea for a Shakespearean-themed murder mystery. At first Lukeman was skeptical. In the regimented world of publishing, it's almost unheard of for a new author to successfully switch genres. "It is very unusual and rarely happens," Tart agreed. "But I knew Jennifer could write well, and her use of dialogue in 'The Speckled Monster' was extremely well done, and so it wasn't much of a leap to believe she could pull this off." What sold Lukeman on the proposal was a summary Carrell included that pointed out what was fact, what was fiction and where the line was blurred. "So much of this novel was dancing around actual fact," Lukeman said. "That's what made it different and, in my opinion, brilliant. Much like 'The Da Vinci Code,' it's a subtle line between fiction and nonfiction. That's what made it so interesting." A 10-page author's note with similar information is tucked in the back of the novel. Deciphering truth from fiction is astonishing, but readers should refrain from peeking until they've finished the book or risk spoiling the multifaceted plot. Carrell began her novel by writing an extensive outline on legal pads while seated in her favorite comfy chair in her Northwest Side home, her two cats and two dogs close at hand. She switched to the computer in her home office to write the actual book, but dozens of pages of small, neat script covered her desk throughout the process. "I connect more to longhand," she said. "A lot of these yellow legal papers sit all over the room when I'm in the throes of writing." Carrell loved the creativity that fiction allowed but also found the freedom difficult at times. The beginning and end of the book were clear to her, but connecting various elements could be a challenge, she said. "It was a lot harder than having my plot dished up for me by history, like in my first book," she said with a laugh. Thanks to her doctoral work, Carrell already knew the Shakespearean facts and myths that she weaves seamlessly into the novel's plot — so familiar, in fact, that she found it more natural to write the few scenes set in the Bard's time than those set in her own. "That's what happens when you study Shakespeare for too long," she said, poking fun at herself. "It's easy for me to write about the 17th century but not the 21st." To help with the modern tale that dominates the book, the author did "atmospheric research" in England and Spain. She traveled the same path as the protagonist whenever feasible and acted out chase scenes with her husband in London, toured a medieval library with her mother in Spain and scouted likely murder locations with a friend in D.C.
"Place is very fundamental to my imagination," she said. "I want to make a world that's very palpable and sensual." To help set scenes, the former music critic often listened to music that matched the mood she wanted to convey. "Often I'll use soundtrack music from films I love because soundtrack music is meant to be in the background," she said. "I've written some of the thriller moments to the 'Gladiator' or 'Braveheart' soundtrack. For lighthearted moments I use 'Shakespeare in Love.' Mozart's Requiem is lovely for emotional scenes." It took Carrell a year to write the novel, which had a first printing of about 100,000 copies, but she insisted it didn't feel like work. "Sometimes when I've gotten inside the world and gotten the characters in position and I know what they're doing, they take off on their own and it's almost like taking notes," she said with a bit of wonder. In fact, her characters even occasionally surprised their creator. "The killer changed identity on me during the course of writing the book," she confessed. If she found herself struggling, she would go to a yoga class or try walking in Sabino Canyon or on the Finger Rock Trail, but more often than not, she didn't get stuck. "I try to stop when I still have something to say so it's a jump-start in the morning," she said. "Sometimes when you're really having fun it can be hard to stop, too." "It's a lot of fun," she said, her eyes sparkling with excitement. "I can't imagine anything I'd rather do." • Name: Jennifer Lee Carrell. • Hometown: Carrell moved to Tucson with her family at age 3. The move was a homecoming for her parents, Bill and Melinda Carrell, who both grew up in Phoenix, and it made Carrell and her younger brother, Bill Carrell III, a local firefighter, fourth-generation Arizonans. • Favorite books as a child: King Arthur legends, the OZ books and the "Lord of the Rings" series, which she still reads annually. • Ballet: Carrell studied ballet from ages 5-18 and wanted to pursue a career as a professional dancer. • Books vs. ballet: They were kind of parallel. - B.A. in English literature from Stanford University. - B.A. in English literature with a focus on Old Norse from University of Oxford in London, England. - Ph.D. in English literature with a focus on Shakespeare from Harvard University. • Name of dissertation: Traveling where the wild things are: a cultural history of romance, exploration and the idea of fiction in England, 1475-1625. Harvard, 1994. • First Shakespeare performance she attended: "A Midsummer Night's Dream" ballet. • Favorite Shakespearean character's death: "There are so many and they are all so brilliant. The most romantic are the double suicide of Romeo and Juliet, but the one with the most interesting ripple effect is Hamlet's father." • Favorite Shakespeare quote: "Journeys end in lovers meeting, Every wise man's son doth know." — "Twelfth Night." • How does it feel to be compared to "The Da Vinci Code," one of the most widely read books of all time: "Wonderful, of course. But also a bit of a two-edged sword. I think lots of people who like the 'DV Code' will like my book. But I also think that people who hated the 'DV Code' (but like thrillers and literary mysteries) will like my book." • More information: www.jennifer leecarrell.com and myspace.com/jenleecarrell. ● Contact reporter Sarah Mauet at 573-4124 or at smauet@azstarnet.com.